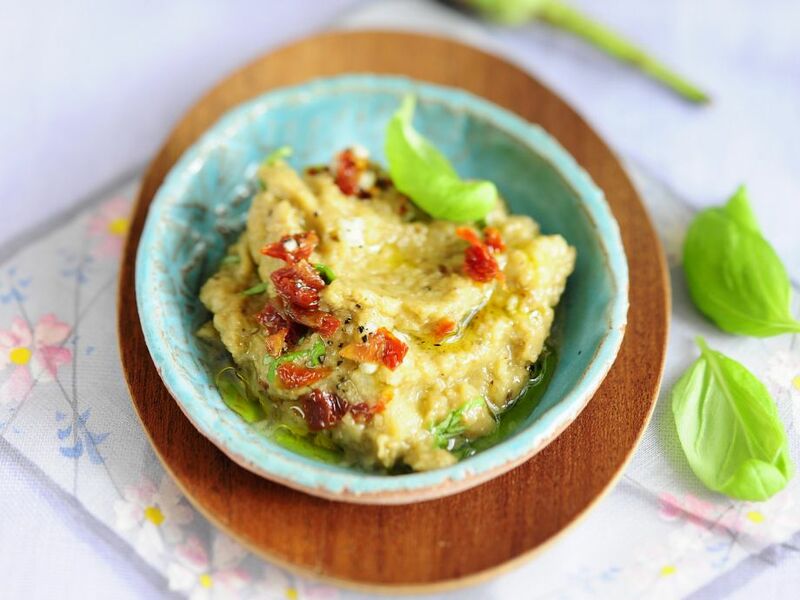 Eggplant and Basil Spread - Creamy, aromatic and vegan - a winning combination! 1 Rinse the eggplant, trim the stem, and cut lengthwise into slices. Place on a foil-lined baking sheet and cook under the broiler for 8 to 12 minutes, until tender and golden brown. Remove and let cool. 2 Peel the garlic. Rinse the basil, pat dry, and pluck the leaves. 3 Combine the eggplant, lemon juice, oil, garlic, and half the basil in a blender and puree. Season with salt and pepper. 4 Rinse and finely chop the tomatoes. Tear the remaining basil leaves. 5 Garnish the spread with tomato and basil and serve.